MicroUAV is pleased to offer a new line of pneumatic systems tailored to lightweight aerial use. We offer on board compressors, electronic PWM logic controllers, actuators, and other accessories. These components are easy to install, lightweight and fully self contained. 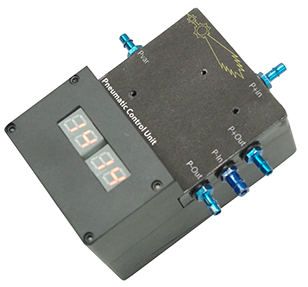 The Pneumatic Control Unit is a four valve, pneumatic controller capable of driving a variety of combinations of pressure and vacuum from a single compressor. The device features lightweight, high frequency valves, precision sensors, and a variety of input options for precise, simple control. The flexible design allows inputs via digital, analog, PWM, or serial. The standard design provides one positive pressure output, one negative pressure output and one variable pressure. 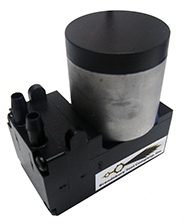 This unit is suitable for a wide variety of applications such as brakes, landing gear, animatronics, shock dampers and other pneumatic devices. BTC is also capable of designing and producing custom variants to meet your specific needs. The Brushless Compressor provides a source of pressure and vacuum to drive components that are controlled by the Pneumatic Control Unit. The lightweight compressor unit is attached to the pneumatic control unit which handles all drive functions. The Brushless Compressor is capable of sourcing up to 33psi of pressure and 10psi of vacuum. This reliable unit is rated for up to 10,000 hours of operation. Our Retractable Landing Gear is designed to work with our pneumatic system for simple, lightweight braking and gear deployment. Through the use of air bladders, the landing gear also functions as an effective shock absorber, softening hard landings.